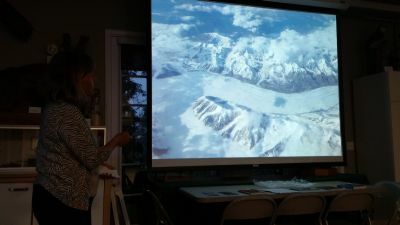 Our speaker, Donna Foyle, talked about her birding trip to St. Lawrence Island, Alaska. 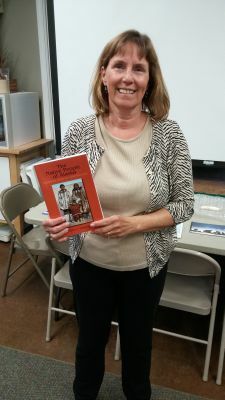 She stayed four nights at the village of Gambell, which has no motorized vehicles except ATVs. About 600 Yupik native Americans call Gambell home. All supplies, food, building materials,clothes, televisions, ATVs etc. must be flown in. The second leg of the trip was in Nome, where they saw glaciers with blue ice, melting into the sea. 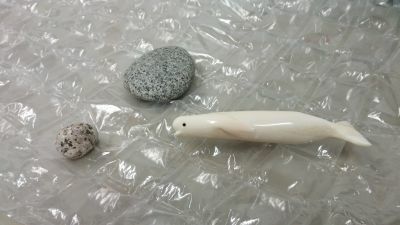 Donna purchased a hand carved ivory walrus tusk image of a whale as a souvenir. The residents depend on tourists to supplement their incomes. The rocks were samples of the hard-to-walk beach area. This was the last meeting of the club year. See you again on the trails and back at Fern Hollow Nature Center in September. May 7, Saturday, 10:00 a.m. Raccoon Creek State Park Wildflower Reserve, by Dianne Machesney. Bring a picnic lunch. June 3, Friday, 10:00 a.m. Buzzard Swamp, Marionville, by Bob Machesney. This will be for dragonflies and butterflies. Bring a net. Dress for ticks. 4 mile loop. Bathroom available in parking lot. No picnic tables. June 11, Saturday, Wissahickon Annual Picnic, Mingo Creek State Park. Nature walks before and after lunch beginning at 10:00am. Click here for details. June 24, Friday, 10:00 a.m. Whiskerville Gamelands by Bob Machesney. This will be for dragonflies and butterflies. Bring a net. Dress for ticks. 4 mile loop. No bathrooms. Rain date will be June 26. Directions From Pittsburgh: 79N to 422E to Rt 8 N. Go 1.2 miles to Rt 308N. Go 14.2 miles to Annandale (past Montour High School) turn right onto Branchton Rd. (SR 4010) Go 2.4 miles to Whiskerville. Turn left onto Kohlmeyer Rd. Go 2.2 miles, across SRCreek Bridge/RR grade. Turn right into parking lot. August 6, Saturday, 10:00 a.m. Jennings Prairie by Dianne Machesney. Directions From Pittsburgh: 79N to 422E roughly 5.8 miles to 528N. Go 7 miles. Meet in the Jennings Prairie parking lot on the left (west) side of the road. 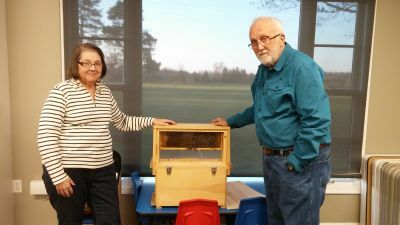 Our speaker, Norm Diebold and his wife, Linda gave us an introduction to Bee Farming. His hives reside at Fern Hollow Nature Center and are used for educational purposes. We learned there are seven recognized species of honey bees and 20,000 other bee species. They have been around for 30 million years. A typical hive will have 20,000 to 30,000 bees. Queens can live for 2-3 years. All the workers are female and drones are male. The worker bees can sting only once and it causes their death. Queens and drones can sting multiple times. 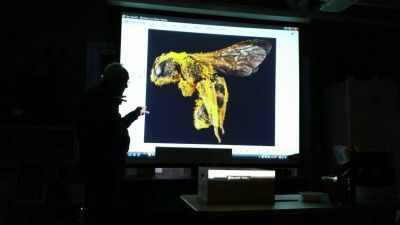 Norm talked about the ways bees communicate with pheromones, how they gather nectar to make honey, store pollen and seal cracks in the hive with propolis. Honey is antibacterial and never goes bad. He went into a lot of detail about hive management and winter survival. The biggest problem is managing/preventing mite infestations. There were many questions, and Norm patiently answered them all. 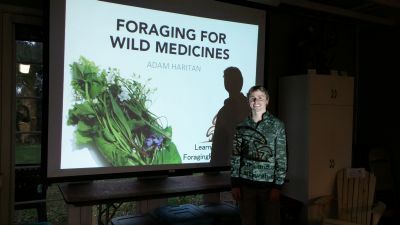 Our speaker, and club member, Adam Haritan, presented Foraging For Wild Medicines. 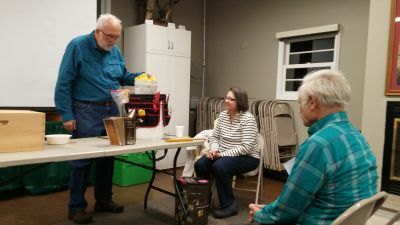 After a lively introduction about the benefits of wild foods, Adam highlighted a few plants and mushrooms that appear in spring, including Hawthorne, Stinging Nettle, White Pine Pollen and Turkey Tail mushrooms. He talked about the health value of each and how to make teas, decoctions and tinctures, using his favorite ethanol product – 40% Organic Vodka. 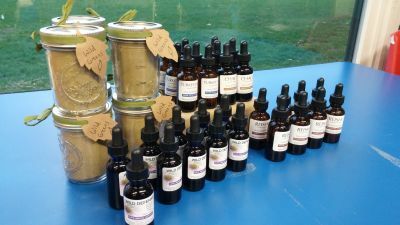 Adam had an array of his tinctures for sale. He uses his medicines as tonics, at low dosage levels and is not giving medical advice for particular ailments. See your doctor for that!